Today Paul Steinbrueck has some thoughts to share with us, and I’m grateful for his encouragement and support of my new book, All Pro Dad. I hope Paul’s words will be an encouragement to you as well. All Pro Dad: Seven Essentials to Be a Hero to Your Kids is an excellent playbook for fatherhood. Mark Merrill has filled the book with lots of gems of wisdom. Here are 25 of my favorites. 2. Our job as dads is to stay the course and to persevere when trouble comes our way, even during the darkest and most difficult hours of our children’s lives. 4. Love is not a feeling; it is a decision. Love is an act of the will to be patient, kind, gentle, humble, sincere, compassionate, giving, faithful, trusting, forgiving, uniting, and persevering. 5. Hail Mary passes don’t work in fatherhood. Fathering is all about a dad moving the ball forward in his relationship with his child, one yard at a time, day in and day out. 6. Image is how we think others view us… Identity is who we really are. 7. You were created exclusively by God and for God… There were no flaws in your design & no errors in your construction. 8. Our children need to know that we love them for who they are, not for what they do. 10. Think of your role as a father as being your job – your most important job – because it is. That should be your mindset. 11. Your job is not that of a general contractor… Your job is that of CEO in your home. 12. Don’t follow your heart, lead your heart. 13. The problem with following your heart, as most people define it, is that you are just chasing whatever feels right at the moment, even though it may not be right. 14. A father who leads his heart pushes aside what he wants to make himself happy and determines that he will do what’s best for his family. 16. As a father, you are influencing your children all the time. They are watching you. 17. To be a great prototype for our kids to follow, we must be models not only of integrity but also of humility and courage. 18. If you are married, the very best thing you can do for your children is to love their mother. 20. Your pain handled rightly, can turn into your passion and your message to the world. 23. Sooner or later, life is going to drop you to your knees. You have to decide whether or not you’re going to look inward or upward. If you look inward, you will find emptiness. If you look upward, you find strength beyond anything you can imagine. 25. You must be forever expanding your capacity to love in order to expand your capacity to lead in your home. I hope you’ll join me in raising the value of fatherhood and encouraging fathers by tweeting & Facebooking some of these quotes and the whole post. And if you’re a father or love someone who is, you’ll definitely want to buy a copy of All Pro Dad. Which of these quotes resonate with you? 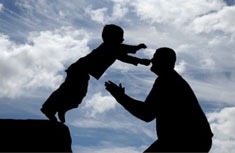 Got any other quotes about fatherhood you’d like to share in a comment?